This ebook reading software is made to provide a 'paper book' experience on the computer screen: For a start, you get two pages side-by-side instead of just one page in the middle of the screen. (Although you can press '1' or '2' to switch between double and single page mode) Next, the pages turn when you click them, just like a real book. Finally, you can also select a textured background to make the pages look like real paper. yBook will read html files, text files, rtf files and pdb/prc files (Palm document format). 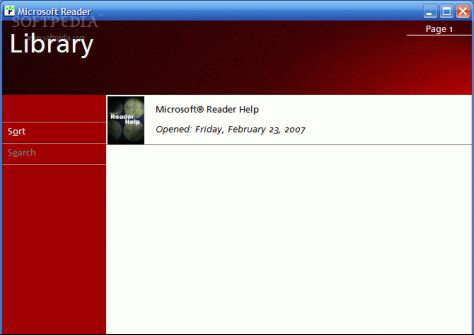 Microsoft Reader is designed to make your onscreen reading experience as close as possible to reading a printed book. In addition, it adds active reading capabilities, instant access to content, and a personal library. Features include high-resolution ClearType and an add-on dictionary, as well as the ability to bookmark, highlight, annotate, make notes and drawings, and much more. exe-eBook Creator enables you to create an executable (program) from a TreePad .tpd or .hjt file. This single "exe-file" contains the TreePad database and Viewer. Weasel is document reader for the Palm Pilot organizers. Unlike other doc viewers for the Palm, Weasel uses zTXT files as its primary format. These are similar in many ways to the de facto standard format, PalmDoc, but they feature much better compression. Weasel also reads PalmDoc files, though, so don't worry. It even supports bookmarks in both formats. The zTXT compression is done using zLib, a Free compression library released under the zLib License. This results in much smaller files than with the PalmDoc method. For example, the Project Gutenberg e-text of "The Merry Adventures of Robin Hood" is approximately 600K in size. Compressed as a zTXT, it is only 261K in size, while with PalmDoc it is about 330K. Since the Palm Pilots do not have very much memory, this is a big savings.